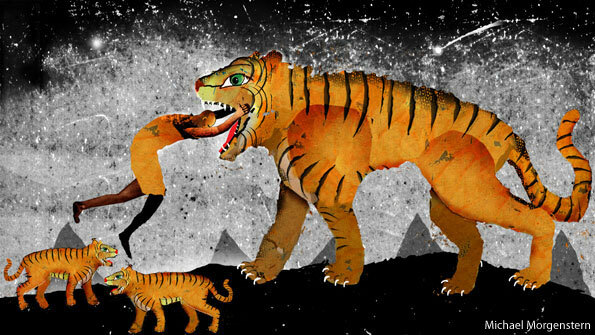 A FAMOUS story tells how, in a previous life, the Buddha took pity on a starving tigress, who might otherwise have had to eat her newborn cubs. He sacrificed himself instead. The tale is often recalled by Tibetans in exile in Dharamsala in northern India as they lament a seemingly endless cycle of self-immolations in their homeland. In the past year at least 26 Tibetans, mostly young Buddhist monks, have set fire to themselves. As they burned, usually to death, they shouted slogans against Chinese rule and for the return of the Dalai Lama, their spiritual leader, who has been based in Dharamsala since 1959. The moral of the tiger parable is that, though Buddhism abhors even self-inflicted violence, it can be justified if the sacrifice is for the greater good. The agonising question, however, is whether these brave acts do anybody any good at all. If the purpose of the protests is to change Chinese policy, they seem woefully counter-productive. Nor have they succeeded in enlisting more than hand-wringing from foreign governments, none of which recognises the Tibetan exile government in Dharamsala. The Dalai Lama, who formally dropped his political role last year, enjoys enormous respect. But respect has no army.The first of the recent wave of suicides, Lobsang Phuntsog, a 20-year-old monk, set fire to himself on March 16th 2011 to mark the anniversary of an uprising against Chinese rule that had flared across the Tibetan plateau three years previously. The timing of that unrest had in turn commemorated the abortive rebellion in March 1959 that led to the flight of the Dalai Lama and some 80,000 of his followers to India. Each year now loads the anniversary with some new grief to be nurtured. Already this month a widowed mother of four and a teenage student have become the first Tibetan lay women to immolate themselves. More such acts are likely throughout the month. In China, protest has provoked not liberalisation but renewed repression, and not only in Tibetan areas of Sichuan province, where the self-immolations began. New arrivals in Dharamsala describe a pervasive Chinese security presence, severe restrictions on movement, night raids to round up activists and only sporadic access to telephone and internet links. The region has been so cut off from the outside world that Reporters Without Borders, an advocacy group, says the foreign press has a bigger presence in North Korea than in Tibet. The smart new reception centre for recent arrivals in Dharamsala tells a similar story. Built to house as many as 500 people, only one-tenth of its beds are in use. In the crackdown that started in 2008, the number escaping to India through Nepal has shrunk from about 3,000 a year to under 1,000. Those who get through tell of families making huge financial sacrifices to raise the money for bribes. Many come to India for a Tibetan education. In the past they planned to return. Now most believe they will be in India a long time. In January 7,000-8,000 Tibetans from China are estimated to have been among the vast crowds attending teachings by the Dalai Lama at Bodh Gaya in India, where the Buddha attained enlightenment. They travelled on Chinese papers. On their return, several hundred were detained. Life for the 20,000 or so Tibetan exiles in Nepal has also become tougher, as the Nepali government cosies up to China and suppresses protests. As China has prepared for this month’s anniversary, as well as for the annual session of the National People’s Congress that opened in Beijing this week, officials have been falling over each other to preach a hard line on Tibet and blame the immolations on the Dalai Lama, who has discouraged but not explicitly prohibited them. Zhu Weiqun, from the Communist Party’s United Front department, who has led China’s team in negotiations with the Dalai Lama’s representatives, has argued for another approach. In an article in a party newspaper he suggests that “some of our current educational and administrative policies have unintentionally weakened [national minorities’] sense of nationhood and Chinese nationalism.” The solution, he thinks, is to do away with the ethnic-minority status marked on identity cards and with privileges such as separate education for minorities. Yet Tibetan identity cannot be abolished by bureaucratic fiat. Tibetans say that it is wrong to see the self-immolations as futile acts of desperation. Rather they portray them as gestures of defiance, of national unity and hence even of hope. Tenzin Atisha, an official in the exiled government, who has sat opposite Mr Zhu in occasional fruitless talks (the most recent of them two years ago), remains optimistic. He notes that the Dalai Lama, who will turn 77 this year, has promised to live to the age of 113. Mr Atisha believes the Communist Party may not last that long and that the Dalai Lama will return to spend his final days in Lhasa. Others are less sanguine, fearing that Han Chinese immigration into Tibet will swamp their culture, that the party will outlive the present Dalai Lama and that it may make hay out of a contested reincarnation. Already, they concede that some Tibetans have given up and decided to make the best of the subsidies and economic growth Chinese rule provides. What is remarkable, however, is that a third post-1959 generation is growing up in Tibetan areas that is largely hostile to China and loyal to the Dalai Lama. Were China only to see it that way, this could be an opportunity. The Dalai Lama, unlike many of his followers, has accepted Chinese sovereignty so long as Tibet has genuine autonomy, and he also opposes violence. Three recent arrivals in Dharamsala are still waiting for the audience their leader traditionally grants newcomers. They say that when they have seen him, they can die without regrets. And they mean it. Through repression, China can doubtless continue to control Tibet. But only the Dalai Lama has any chance of making Tibetans accept Chinese rule.